Four-time champion Tiger Woods will not take part in next week's Masters because of a back injury. 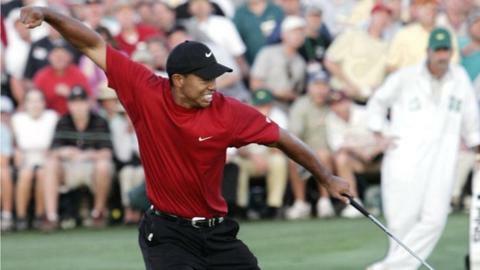 Woods, 40, has not played competitively since August and has had two operations in an attempt to cure the problem. The American insists he is "making progress" in his recovery but has put no timescale on his return to action. "I've decided it's prudent to miss this year's Masters," read a statement. "I've been hitting balls and training daily, but I'm not physically ready." Former world number one Woods also pulled out of the tournament in 2014 with a back problem and finished in a tie for 17th last year. "I've said all along that this time I need to be cautious and do what's best for my long-term health and career," he added. "Unfortunately, playing Augusta next week wouldn't be the right decision. "I'm absolutely making progress, and I'm really happy with how far I've come, but I still have no timetable to return." The 14-time major winner, who has slipped to 472nd in the world rankings, will attend the Champions Dinner at Augusta National on Tuesday.